In the 50 years that Urban Insurance has been in business, we have never spoken to a single customer that was “Happy” to have just been involved in an accident. The truth is accidents happen to even the best of drivers. When an accident does occur you need to remain calm, collect the needed information and make a timely report. The first thing to do upon being involved in a car accident is to gain your composure. This might seem easy or even unimportant, but it is a critical step in resolving the situation and getting your car repaired quickly. I will say what should be understood, “Things can be replaced- people can not”. Job one is to assess if any one in your vehicle is hurt. Having the presence to ask, as well as to look for your self can save lives. Remember, today few of us walk out our door without a phone, if someone in your car need medical help call 911. If you believe injuries are “Borderline;” error on the side of caution and call for help. 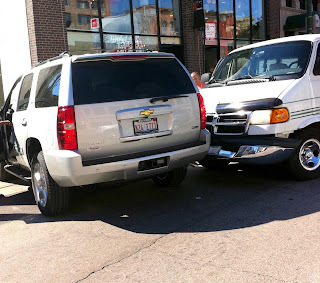 Clearly the next step is to see if anyone in the other car or truck needs help. Don’t forget they call them “Accidents” for a reason. Keep your anger in check. There will be plenty of time to point fingers, first make sure no one is in need of medical help. Please take all reasonable steps to avoid further damage to person and or property by moving cars off to the side of the road and out of harms way. The second step is to obtain all of the information you will need to report the loss to both Urban Insurance Agency, as well as to the police. Urban sent you an accident report card to be completed. We do not require that actual card be used, but it is a great tool to use. If you do not have the card, try to picture the likely questions we will ask when you contact us. Begin with the most obvious, Name, Address, Phone number and Work Number all fall into the category of being able to reach this person. Next move to their insurance information. Remember to ask for the name of the company as well as the name of the office or agency, and get the corresponding phone numbers for each. Clearly it is wise to mark down information on the vehicle(s) in the crash. I already reminded you that you will likely have a phone, and odd are that phone will have a camera. Not only can a “Picture be worth a thousand words,” but the photo will give a more objective account. Report any accident promptly to both Urban Insurance, as well as to the police. Today, most police departments will not send out an officer to the scene unless there are injuries. However a report must be filed; that puts the job on you, the driver. If you fail to file a “Crash report,” this can result in your license being suspended or revoked. Also remember, if you fail to file a report but the driver of the other auto does- only that person’s account of the event will be recorded. Please do not forget to report the accident in to Urban. The sooner the loss is reported the sooner we can help you get your car fixed or replaced. If you wait too long you can put your coverage in jeopardy. Over the past 50 years that Urban Insurance has helped tens of thousands of our customers solve the problems caused by accidents. None of our customers enjoy being involved in an accident, but we do find that they “Are Happy” that they were insured by Urban Insurance.